PARTS of Andalucia are on orange and yellow alert today as Spain’s weather agency AEMET predict strong weather across the coast. AEMET have forecast 80km/h winds in Estrecho, Cadiz, while Malaga could see waves of up to four metres high. Estrecho is placed on orange alert for coastal wind and waves, meaning an important risk in the area. 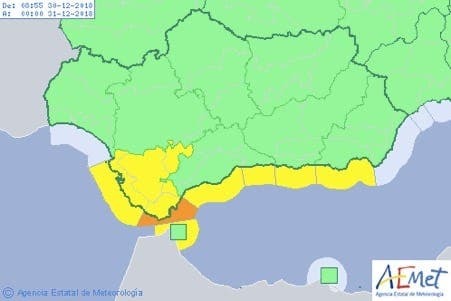 Meanwhile, the provinces of Granada, Malaga and Almeria are all on yellow wind alerts, indicating a risk in these places. Most of the alerts are set to be in place until around 6:00pm this evening, according to AEMET’s website.